I, like everyone else in Silicon Valley, downloaded Secret last week. It's incredibly well done, certainly the best yet of any of the gossip/anonymous apps. Unlike most others, I deleted it, and have thus far resisted reinstalling it (which has been tough!). Unlike Facebook or Twitter, I felt worse--though entertained--after each use. At the point I deleted it, three of my friends had been on the receiving end of super nasty comments. I've often thought about the need for an anonymous social network to go along with the fully public and the friends-only ones. But I can't figure out a way to stop an anonymous network from decaying into a Mean Girls-style burn book. If I were running Secret, my number one focus would be to kill every comment about a specific person or company. If Secret becomes more of a confessional than a burn-book, it can probably thrive. Anonymity breeds meanness--the Internet has proven this time and time again. People are willing to say nice or neutral things with their name attached--they need anonymity for mean things and things they are embarrassed about. In fact, the closer to real identity internet forums get, the less they seem to decay. Anonymous social networks have been (thus far, anyway) in the category of services that get worse as they get bigger--unlike services like Facebook or Twitter that get better as they get bigger. People love gossip until it's about themselves. My prediction for Secret is that it gets very popular (like the previous gossip services) and then eventually the rancor gets untenably bad and people stop using it (like the previous gossip services). But until we reach that point, I assume we'll see some really nasty things that people can't stop reading. Thanks to technology, people can create more wealth now than ever before, and in twenty years they’ll be able to create more wealth than they can today. 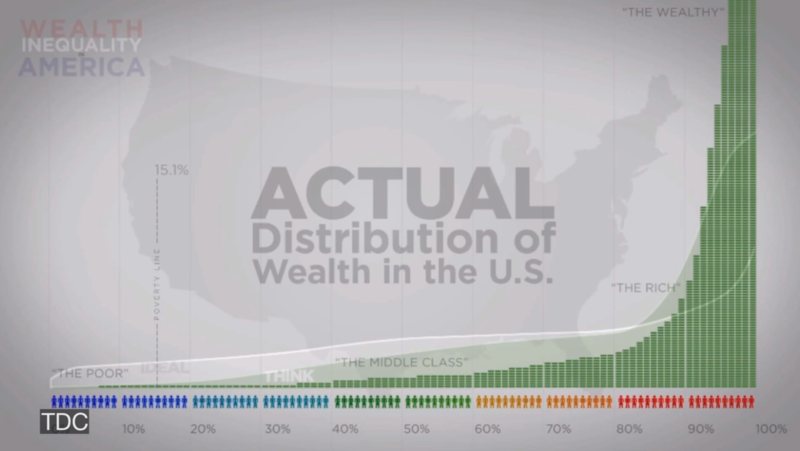 Even though this leads to more total wealth, it skews it toward fewer people. This disparity has probably been growing since the beginning of technology, in the broadest sense of the word. Technology makes wealth inequality worse by giving people leverage and compounding differences in ability and amount of work. It also often replaces human jobs with machines. A long time ago, differences in ability and work ethic had a linear effect on wealth; now it’s exponential. Technology leads to increasing wealth inequality for lots of other reasons, too—for example, it makes it much easier to reach large audiences all at once, and a great product can be sold immediately worldwide instead of in just one area. Without intervention, technology will probably lead to an untenable disparity—so we probably need some amount of intervention. Technology also increases the total wealth in a way that mostly benefits everyone, but at some point the disparity just feels so unfair it doesn’t matter. And critically, without a reasonable baseline of access to wealth, there can be no such thing as equality of opportunity. 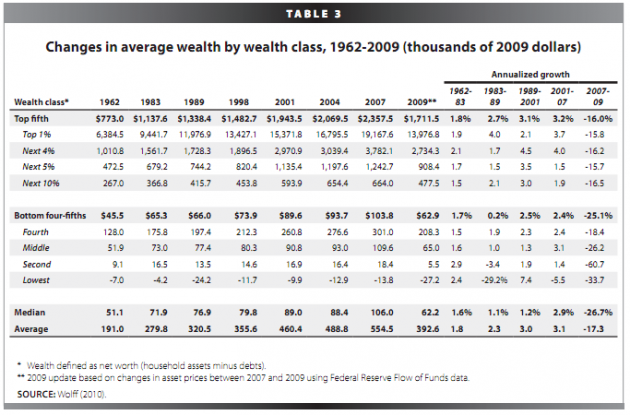 As the following table shows, wealth inequality has been growing in America for some time, not just the last few years. 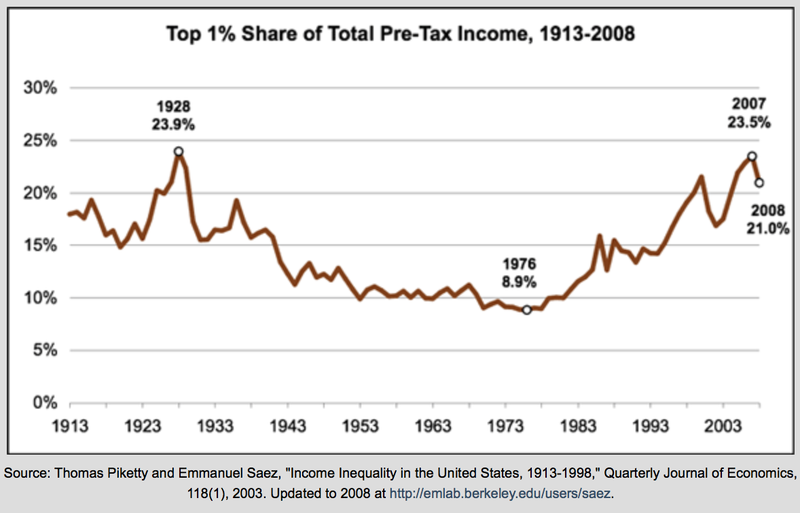 It’s noticeable between the top 20% and bottom 80%, and particularly noticeable between the top 1% and bottom 99%. The best thing one can probably say about this widening inequality is that it means we are making technological progress—if it were not happening, something would be going wrong with innovation. But it’s a problem for obvious reasons (and the traditional endings to extreme wealth inequality in a society are never good). 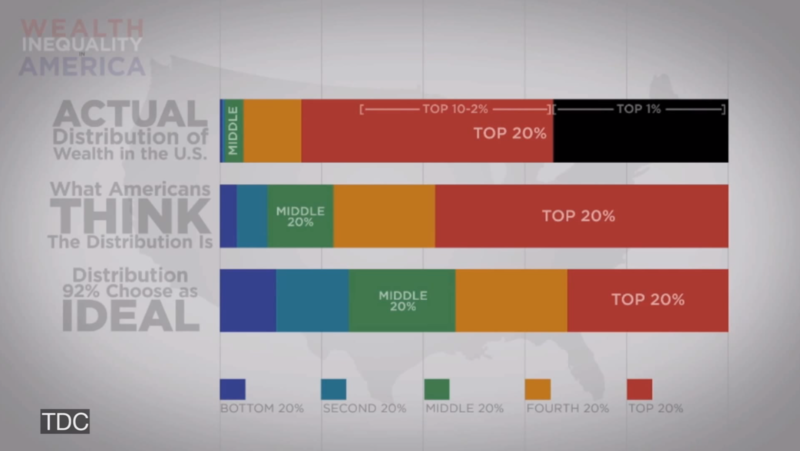 This widening wealth divide is happening at all levels—people, companies, and countries. And either it will keep going, or innovation will stop. But it feels really unfair. People seem to be more sensitive to relative economic status than absolute. So even if people are much better off being poor today than king 500 years ago, most people compare themselves to the richest people today, and not the richest people from the past. And importantly, it really is unfair. Trying to live on minimum wage in the United States is atrocious (http://www.forbes.com/sites/laurashin/2013/07/18/why-mcdonalds-employee-budget-has-everyone-up-in-arms/). That budget, incidentally, assumes that the worker is working two jobs. Even though they’re outputting less value, that person is certainly working harder than I am. We should do more to help people like this. 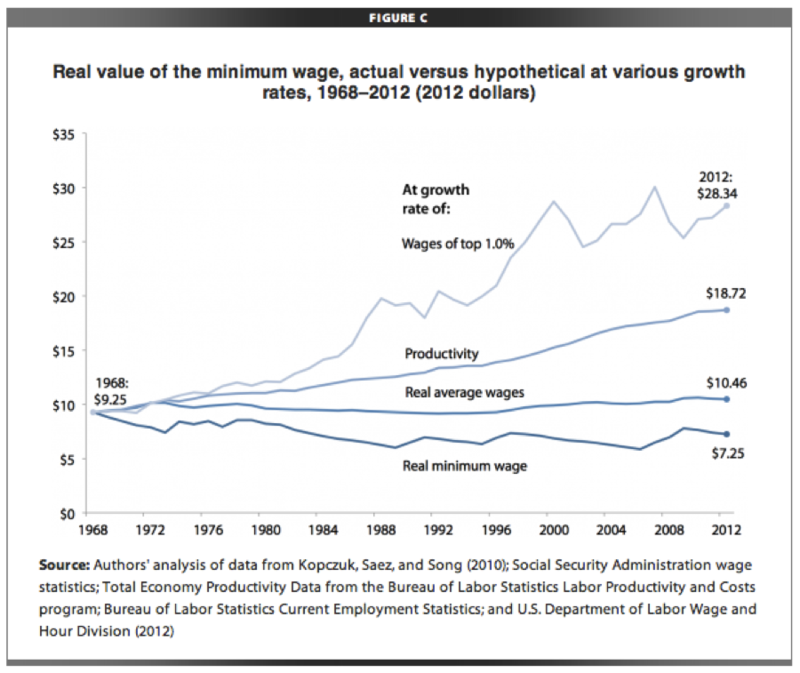 Real minimum wage has declined, failing to track real averages wages and massively failing to track the wages of the top 1%. In a world where ideas and networks are what matter, and manufacturing costs trend towards zero, we are going to have to get comfortable with a smaller and smaller number of people creating more and more of the wealth. And we need a new solution for the people not creating most of the wealth—many of the minimum wage jobs are going to get innovated away anyway. There are no obvious/easy solutions, or this would all be resolved. I don’t have any great answers, so I’ll just throw out some thoughts. We should assume that computers will replace effectively all manufacturing, and also most “rote work” of any kind. So we have to figure out what humans are better at than computers. If really great AI comes along, all bets are off, but at least for now, humans still have the market cornered on new ideas. In an ideal world, we’d divide labor among humans and computer so that we can both focus on what we’re good at. There is reason to be optimistic. When the steam engine came along, a lot of people lost their manual labor jobs. But they found other things to do. And when factories came along, the picture looked much worse. And yet, again, we found new kinds of jobs. This time around, we may see lots more programmers and startups. Better education—in the right areas—is probably the best way to solve this. I am skeptical of many current education startups, but I do believe this is a solvable problem. A rapid change in what and how we teach people is critical—if everything is changing, we cannot keep the same model for education and expect it to continue to work. If large classes of jobs get eliminated, hopefully we can teach people new skills and encourage them to do new things. Education, unlike a lot of other government spending, is actually an investment—we ought to get an ROI on it in terms of increased GDP (but of course it takes a long time to pay back). However, if we cannot find a new kind of work for billions of people, we’ll be faced with a new idle class. The obvious conclusion is that the government will just have to give these people money, and there’s been increasing talk about a “basic income”—i.e, any adult who wanted it could have, say, $15,000 a year. You can run the numbers in a way that sort of makes sense—if we did this for every adult in the US, it’d be about $3.5 trillion a year, or a little more than 20% of our GDP. However, we’d knock out a lot of existing entitlement spending, maybe 10% of GDP. And we’d probably phase it out for people making over a certain threshold, which could cut it substantially. There are benefits to this—we’d end up helping truly poor people more and middle class people less, and we’d presumably cut a ton of government bureaucracy. We could perhaps end poverty overnight (although, no doubt, anything like this would cause prices to rise). And likely most of this money would be spent, providing some boost to the economy. We could require 10 hours a week of work for the government, or not. A big problem with this strategy is that I don’t think it’ll do much to address the feeling of inequality. Many people have a visceral dislike to the idea of giving away money (though I think some redistribution of wealth is required to reasonably equalize opportunity), and certainly the default worry is that people would just sit around and waste time on the Internet. But maybe, if everyone knew they had a safety net, we’d get more startups, or more new research, or more novels. Even if only a small percentage of people were productive, in a world where some people create 10,000x more value than others, that’d be ok. The main point I’m trying to make is that we’re likely going to have to do something new and uncomfortable, and we should be open to any new ideas. But this still doesn’t address the fundamental issue—I believe most people want to be productive. And I think figuring out a much better way to teach a lot more people about technology is likely the best way to make that happen. Thanks to Nick Sivo for reading a draft of this. It’s easy to forget this. A lot of stuff feels like work—commenting on HN, tweeting, reading about other companies’ funding rounds, grabbing coffee, etc —is not actually work. (If you count that as work, think really hard about the value you’re creating in your job.) These activities can be worthwhile in small doses—it’s important to network and meet interesting people to stay in the flow of ideas—but they are not by themselves how new wealth gets created. Value gets created when a company does things like build widgets and sell them to customers. As a rough guideline, it’s good to stay in roles where you’re close to the doing. Of course you have to do the right things. Writing software no one wants does not create value—that’s called a class project. So it’s critical to figure out the right thing to work on, and strategy is far more valuable than a lot of pivot-happy companies would have you believe. But strategy alone has no value—value gets captured by execution. It’s easier to sit around and talk about building a startup than it is to actually start a startup. And it’s fun to talk about. But over time, the difference between fun and fulfilling becomes clear. Doing things is really hard—it’s why, for example, you can generally tell people what you’re working on without NDAs, and most patents never matter. The value, and the difficulty, comes from execution. There are good tricks for keeping yourself honest here. When I was running a company, I used to make a list of everything I got done at the end of the day. It was remarkable how I could feel like I had a really busy day and realize that night I got nothing done. Similarly, I could have a day that felt only somewhat busy, but accomplish 3 or 4 major things. You build what you measure—if you measure your productivity by the number of meetings you have in a day, you will have a lot of meetings. If you measure yourself by revenue growth or number of investments closed or something like that, you will probably have fewer meetings. Another example of not-quite-work is every night in San Francisco, there are dinner parties where people get together and talk about the future. It’s always fun and usually not very contentious—most people agree we need to go to space, for example. But at the end of it, everyone goes home and works on something else. If you’re reading this and feeling unproductive, there’s a silver lining. You can just close the browser window. The good news is that it’s easy to course-correct, and it feels great. I count blogging as a marginal use of time, but the reason I started is because I realized it was important to be good at writing, I was bad at it, and the only way I was going to improve was with lots of practice. And sometimes I meet really interesting founders because of something I wrote. This isn’t meant as any sort of relative value judgment; if what you want to do is build an enterprise software company, then you should do that. The problem comes when what you really want to do is build rockets. A lot of people feel like they first should do something to make money and then do what they care about (or first work at a company for awhile before starting a company they really want to start). While you of course should take care of your family before anything else, you should try to work on what you really care about. You can usually find a way. The danger is that life is short and you only get to work on a small number of companies over the course of a career—it’s worth trying to make them count. As part of this, they don't put anyone between the founders and the users. The founders of these companies do things like sales and customer support themselves. *They are obsessed with talent. The founders take great pride in the quality of their team and do whatever it takes to get the best people to join them. Everyone says they only want to hire the best people, but the best founders don't compromise on this point. If they do make a hiring mistake, they fix it very quickly. And they hire very slowly. They don't get any thrill out of having employees for its own sake, and they do the dirty work themselves at the beginning. As part of this, they really focus on getting the culture of the company right. *They can explain the vision for the company in a few clear words. This is most striking in contrast to companies that require multiple complicated sentences to explain, which never seem to do really well. Also, they can articulate why they're going to succeed even if others going after the problem have failed, and they have a clear insight about why their market is a great one. More generally, they communicate very well. *They generate revenue very early on in their lives. Often as soon as they get their first user. *They are tough and calm. Founders of great companies are always tough and unflappable. Every startup seems like it's going to die--sometimes multiple times in a single day--and founders of really successful companies just seem to pull out a gun and shoot the villain without losing their train of thought. Formidableness can be developed; I've seen weak-seeming founders grow into it fast. *They keep expenses low. In addition to hiring slowly, they start off very frugal. Interestingly, the companies that don't do this (and usually fail) often justify it by saying "we're thinking really big". After everything is working really well, they will sometimes ramp up expenses a lot but manage to still only spend where it matters. *They make something a small number of users really love. Paul Buchheit was the first person I ever heard point this out, but it's really true. Successful startups nearly always start with an initial core of super happy users that become very dependent on their product, and then expand from there. The strategy of something that starts with something a huge number of people sort of like empirically does not work as well. *They grow organically. And they are generally skeptical of inorganic strategies like big partnership deals and to a lesser extent PR. They certainly don't have huge press events to launch their startup. Mediocre founders focus on big PR launches to answer their growth prayers. *They are focused on growth. The founders always know their user and revenue numbers. There’s never any hesitation when you ask them. They have targets they are trying to hit for the next week, month, and year. *They balance a focus on growth with strategic thinking about the future. They have clear plans and strong opinions about what they're going to build that no one can talk them out of. But they focus more on execution in the moment than building out multi-year strategic plans. Another way this trait shows itself is "right-sized" first projects. You can't go from zero to huge; you have to find something not too big and not too small to build first. They seem to have an innate talent for figuring out right-sized projects. *They do things that don't scale. Paul Graham has written about this. The best founders take it unusually far. *They have a whatever-it-takes attitude. There are some things about running a startup that are not fun. Mediocre founders try to hire people for the parts that they don't like. Great founders just do whatever they think is in the best interest of the company, even if they're not "passionate" about that part of the business. *They prioritize well. In any given day there are 100 reasonable things that you could work on. It's easy to get pulled into a fire on number 7, or even to spend time at a networking event or something like that that probably ranks in the mid-90s. The founders that are really successful are relentless about making sure they get to their top two or three priorities each day (as part of this, they figure out what the right priorities are), and ignoring other items. *The founders are nice. I'm sure this doesn't always apply, but the most successful founders I know are nicer than average. They're tough, they're very competitive, and they are ruthless, but they are fundamentally nice people. *They don't get excited about pretending to run a startup. They care about being successful, not going through the motions to look successful. They get no thrill from having a 'real' company; they don't spend a lot of time interviewing lawyers and accountants or going to network events or anything like that. They want to win and don't care much about how they look doing so. One reason that this is super important is that they are willing to work on things that seem trivial, like a website that lets you stay on an air mattress in someone's house. Most of the best ideas seem like bad ideas when they start, and if you're more into appearance than substance, you won't want people laughing at you. You are far better off starting a company that people laugh at but keeps growing relentlessly than a company with a beautiful office that seems serious but is always two quarters away from starting its growth ramp. *They get stuff done. Mediocre founders spend a lot of time talking about grand plans; the best founders may be working on things that seem small but get them done extraordinarily quickly. Every time you talk to them, they've gotten a few new things done. Even if they're working on big projects, they get small chunks done incrementally and have demonstratable progress--they never disappear for a year and jump from nothing to a huge project being completed. And they're reliable--if they tell you they'll do something, it happens. *They move fast. They make quick decisions on everything. They respond to emails quickly. This is one of the most striking differences between great and mediocre founders. Great founders are execution machines. Most of the time, we worry far too much about tail risk. We worry about terrorist attacks and necrotizing fasciitis, but not much about heart disease or car crashes. But in 2011, 17 US citizens worldwide died as a result of terrorism and approximately 150 from necrotizing fasciitis. There were nearly 600,000 deaths resulting from heart disease and over 32,000 from car crashes. Based on current data, you are about 35,000 times more likely to die from heart disease than from a terrorist attack. So everyone smart says that we worry about terrorism way too much, and so far, they’ve been right. For whatever reason, we seem to be wired to overweight the risk of the dramatic, scary, but very unlikely and underweight the risk of the mundane, familiar, and probable. But maybe there are some tail risks we should really worry about. Our risk-evaluation miscalibration leads to important blind spots. We’ve seen images of a nuclear explosion; we know how terrifying that is, and so we fear it. Most people have had the flu, and so we don’t fear that—we know it’s possible to die from the flu, but most people don’t. Death from the flu doesn't trigger most peoples' panic sensors because the version of it we know is boring and familiar. However, I don’t think we have collectively thought enough about how biotechnology is going to change the landscape. Of all “technologies", it’s the one thing that really scares me. Biotech has incredible potential to improve our lives, probably even more so than computers, but of course that comes with much graver downside. Also in 2011, some researchers figured out how to reengineer H5N1—avian influenza virus—to make it much scarier by causing five mutations at the same time that all together made the virus both easy to spread and quite lethal. These five mutations could all occur in nature, but it’d be unlikely in the same copy of the virus. I have no doubt that the media overstated the danger, but it’s still worth thinking about. We now have the tools to create viruses in labs. What happens when someone creates a virus that spreads extremely easily, has greater than 50% mortality, and has an incubation period of several weeks? Something like this, released by a bad guy and without the world having time to prepare, could wipe out more than half the population in a matter of months. Misguided biotech could effectively end the world as we know it. When the H5N1 work happened, there was a lot of debate about whether or not to release the research. The researchers put a voluntary moratorium on releasing the information, which they lifted earlier this year. Trying to keep things secret is not the answer. Trying to criminalize knowledge of dangerous things (we tried this with the atomic bomb) is definitely not the answer. But ignoring real danger is not the answer either. The world is very bad at coordinated action. Unlike an atomic bomb, which has grave local consequences, the first of these pathogens that gets released could have grave global consequences almost instantly, and give us very little time to react. While enriching uranium requires the resources of nations, biotech development is already routinely privately funded. Spending a lot of effort on proactive defense against bioattacks is something we should prioritize very highly. When we first became able to create software programs in garages, it changed the world in very fundamental (mostly positive!) ways. As we begin to be able to create biology programs in garages, we should remember that bigger changes are likely coming--hacking our bodies will likely be more powerful than hacking bits. We may have to move even faster to adapt our society than we did with the computer revolution. Thanks to Patrick Collison, Connie Gibstine, and Nick Sivo for reading drafts of this. Biotechnology is scary in a lot of non-obvious ways. Sure, it’s easy to understand why superviruses are scary. But another possibility is that we engineer the perfect happiness drug, with no bad side effects, and no one wants to do anything but lay in bed and take this drug all day, sapping all ambition from the human race. There are a lot of other possibilities too, and it’s very hard to think of them because we don’t have much experience with what's about to happen. All companies that grow really big do so in only one way: people recommend the product or service to other people. What this means is that if you want to be a great company some day, you have to eventually build something so good that people will recommend it to their friends--in fact, so good that they want to be the first one to recommend it to their friends for the implied good taste. No growth hack, brilliant marketing idea, or sales team can save you long term if you don't have a sufficiently good product. You can trick yourself for awhile, though: growth is measured on a percentage basis from last month. When you are still small, you can spend a lot of money marketing or advertising and have a big impact on usage growth. But eventually, you get so big you simply can't spend enough money to move the needle--you need your ever-increasing userbase to keep getting you more users. There are exceptions to this, of course, where monopolies are involved--Microsoft may turn out to be the interesting test case of the extreme outer limit of how long you can manufacture growth. The only way to generate sustained exponential growth is to make whatever you're making sufficiently good. For example, refer-a-friend-to-earn-credits programs work if the product is good enough to recommend anyway (e.g. Dropbox, Uber). But they fail for most other startups that try them, because the product isn't good enough yet. Having a growth team is still a good idea--you almost always need to jumpstart things. But don't forget about what you actually have to accomplish. Thanks to Jack Altman for reading a draft of this. Maybe bitcoin will be the world reserve currency, maybe it will totally fail, or maybe it will survive in some niche capacity. I don’t know how to weight the probabilities (although I think in the immediate term it's likely to go down), but I do have a thought about the metric to watch: growth in legitimate transactions. A currency without the major use case being legitimate transactions is going to fail. Right now, the dominant use case of bitcoin seems to be speculation, with a secondary use case for illegal transactions. The fact that the few merchants willing to accept bitcoin generally convert to dollars right away suggests an underlying lack of faith in bitcoin—or at least a problem with the volatility. It’s also a reflection of the reality that a business still needs to deal in dollars with most of the world. The estimates I’ve heard from smart people that really follow bitcoin are that legitimate transactions are up only about 2-3x from a year ago—wildly outpaced by growth in speculation. If bitcoin is going to work as a currency, at some point before the music stops, legitimate transaction growth needs to really pick up. When friends ask me how to buy bitcoin, I always ask why they want to buy before I help. The main driver is the very human desire to get rich quickly without doing much work combined with a fervent belief that someone else will pay more for the coins later—the tulip strategy. The second major reason is out of fear that there is a small chance bitcoin becomes the reserve currency. Even if the chance is tiny, maybe it makes sense to buy some as a hedge (this was why I bought the small amount that I have). Neither of these can sustain bitcoin as a currency, nor can drugs and gambling (people that make their money in the underworld still need money that can buy regular things, and so whatever is used to track exchange still needs to be pegged to dollars or whatever). The tulip strategy is especially scary; an eventual crash could be so severe that it will shake even the truest believer’s conviction. The price of tulip bulbs has yet to recover from its 1637 peak. Some people claim that bitcoin is not really a currency but a store of value, like gold. Maybe. This would be a personal blindspot for me; I’ve never thought gold was the best place to put money. As I understand it, some people transact in gold, and it has at least some industrial and ornamental uses. It seems to me that the people that prepare for the end of the world—i.e. the people I know that really like gold—are likely to prefer something they can hold in their hands than something that requires the Internet to keep working. Whether or not bitcoin should be compared to dollars or gold, there are a lot other weird factors at play that make it hard to weight probabilities—for example, bitcoin provides a way to convert RMB into dollars. You can mine bitcoin with energy purchased in RMB and then later sell those reward bitcoins for dollars! This is just one of many ways to use it for money laundering--there are lots more, and this alone may be enough to sustain it for awhile. A second big issue until the US switches from USD to BTC, you’re still going to owe taxes in dollars. The fact that you have to do things like pay taxes and buy oil in dollars seems to make it hard for bitcoin to become the reserve currency—people will still need dollars more than they need bitcoins. A third issue is that although we have big strong guys holding guns to remind anyone that a dollar is worth a dollar, we do not have such an effective reminder that a bitcoin is worth a bitcoin. Currencies have traditionally needed a central actor to enforce them. All of that said, there’s clearly something very interesting going on. And the bull case is exciting—a world where we all transact in bitcoin would be much more transparent, and financial transparency is great. It’s perhaps the thing that would most reduce corruption. (Of course, it's possible, even likely, that everyone just gets good at anonymizing bitcoin by passing around entire wallets or whatever.) Transparency is not the only benefit--for example, even if we don't get transparency, low transaction costs for worldwide commerce would still be great. Just as it’d be stupid to convert all your dollars to bitcoin, it’d be stupid to not pay attention. Specifically, watch legitimate transaction volume--I'd suggest only buying if it shows signs of seriously ramping up. Thanks to Patrick Collison and Lachy Groom for reading drafts of this. I frequently get asked by non-technical solo founders if I know any potential hacker cofounders they should talk to. These people give a passionate pitch for the idea and a long list of all the hustling they've done, customers they've spoken to, models they've built, provisional patents they've filed, etc. Most of the time, they are thoughtful and hardworking. But they've often been searching for their technical cofounder for many months, and things have stalled during that process. When people like this say "I'll do whatever it takes to make this business successful" (which they almost always say), I say something like "Why not learn to hack? Although it takes many, many years to become a great hacker, you can learn to be good enough to build your site or app in a few months. And even if you're not going to build the next version, if you're going to run a software company, it seems like a good idea to know a little bit about it." Usually the response is something like "That wouldn't be the best use of my time", "I don't like it", or "I don't have that kind of brain". (Earlier today it was "You don't understand, I'm the idea guy. If I'm hacking, who will be talking to investors? ", which is what prompted this post.) But every once in awhile people think about it and decide to learn to hack, and it usually works out. They’re often surprised how easy it is. Many hackers love to help people who are just starting. There are tutorials for pretty much everything and great libraries and frameworks. As an important aside, if you try to learn on your own, it can be really hard. You’ll hit some weird ruby error and give up. It’s important to have someone—a friend, a teacher at a coding bootcamp, etc.—that get you through these frustrating blocks. When hackers have to for their startups, they are willing to learn business stuff. Business people should do the same. If you're not willing to do this, you should remember that there are far greater challenges coming in the course of a startup than learning how to code. You should also remember that you can probably learn to code in less time than it will take to find the right cofounder. Speaking of cofounders, a word of warning: meeting a stranger for the express purpose of cofounders hardly ever works. You want someone you've known for awhile and already worked with. This is another good reason for learning to hack yourself instead of bringing on a cofounder. You can build the first version of your product, and even if it's terrible (we had a non-technical founder in YC that learned to hack with Codecademy and was still able to learn enough to build a prototype), you'll actually be able to get real user feedback, iterate on something other than mockups, and perhaps impress a great hacker enough to join you. Although you may never win a Turing Award, if you're smart and determined, you can certainly get good enough to build a meaningful version 1. If you're a solo founder and you can't hack, learn. One of the most interesting changes in venture capital going on right now is the separation of advice and money. For a very long time, these have been a package deal. Great advice is really important; some founders don’t appreciate this initially (I was guilty of it) but always learn to. But great advice does not have to come from venture capitalists; it often comes from people like former founders. There have been a few small indications of the advice/money separation over the past few years, but crowdfunding is now really making it happen. Some companies can raise money on very good terms from investors that don’t know much about startups, and then give equity to the advisors they want to work with. There are probably going to be big advantages and big disadvantages to this. On the positive side, founders may end up with less total dilution and get to choose whatever advisors they want—not just the people that happen to manage institutional money. Another big positive is that more competition (and more transparency) makes investors behave better. On the negative side, advisors probably won’t work quite as hard for a company that they don’t have a lot of capital invested in. Also in the negative column, this will probably further worsen founders’ disrespect for capital. And perhaps worst of all, I expect a lot of people to lose a lot of money—startup investing is both hard and appeals to gambler’s instincts, and it’s easy to imagine it becoming the new daytrading. At some point, of course, the pendulum will swing back. Advisors will probably still put in some capital, but probably at a better effective price than people who just invest. The hard part is that everyone thinks they are a great advisor and wants the special treatment. The bigger force at work is the long-term trend towards founders having more leverage than investors. This change in leverage has happened for a lot of reasons, but specifically, crowdfunding probably would not have been possible if companies needed as much capital to start as they did ten years ago. Also, startups are cool now, so more people want to invest. Quick and painless fundraising, without advice necessarily being part of the package, is what many founders want. In a sense, VCs sell advice, but founders want to buy money. Crowdfuding is an answer to this (also, the crowd is willing to fund things VCs are not, pay higher prices and on very clear terms, etc.) Fundraising has not been an efficient market—VCs and angels have been able to corner it with laws, access, and it being the only source of advice. But the Internet continues its never-ending march. The best VCs are great, and they will probably continue to do well. In fact, they’re so good that they could probably get away with only selling advice—they understand how to build big companies in a way that few other people in the world do. They may have to adapt their strategy somewhat—for example, in response to being able to buy less ownership in earlier rounds, I suspect some firms will shift to writing much larger checks to the obvious winners in later rounds. The mediocre and bad VCs will have to adapt or die.